The Mauser C.96 (Construction 1896) was the first successful semi-automatic pistol to see serial production. Whilst it might look archaic to modern eyes, features such as a 10-round magazine and mechanical action were considered the future of arms design as the nineteenth century turned into the twentieth. 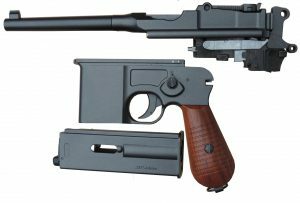 The German C.96 was never adopted by their forces, but 150,000 were ordered during WW1 to supplement the service P-08 or Luger pistols. Production briefly stopped after the war before the allies allowed Germany to continue making the C.96 and before long, the pistol became popular with Chinese warlords and Bolshevik revolutionaries. The Chinese imported the pistol in huge numbers from Mauser, and from Spanish gunmakers such as Astra, who made copies of the pistol, some of which were capable of full automatic fire. When Mauser saw they were losing sales to foreign copies, they introduced the ‘Schnellfeur’ (rapid fire) in 1932 and exported around 50% to the Chinese market. 10-shot Mauser looks better on the eye, the 20-round detachable magazine was chosen because it was the only real option for storing a standard CO2 Powerlet. 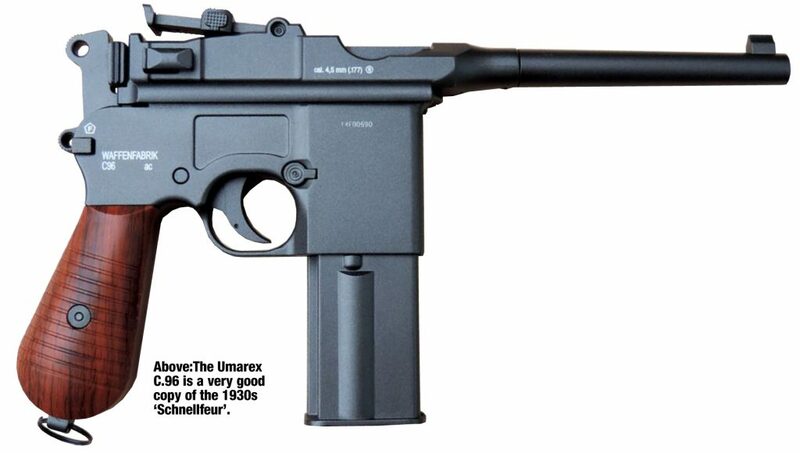 Early versions of the Umarex Legends Mauser were blow-back, semi-auto pistols, but were made mainly of plastic externally. This resulted in a lighter than natural weight and although realistic from a distance, as soon as you picked up one of these pistols, it felt as light as a hollow toy. 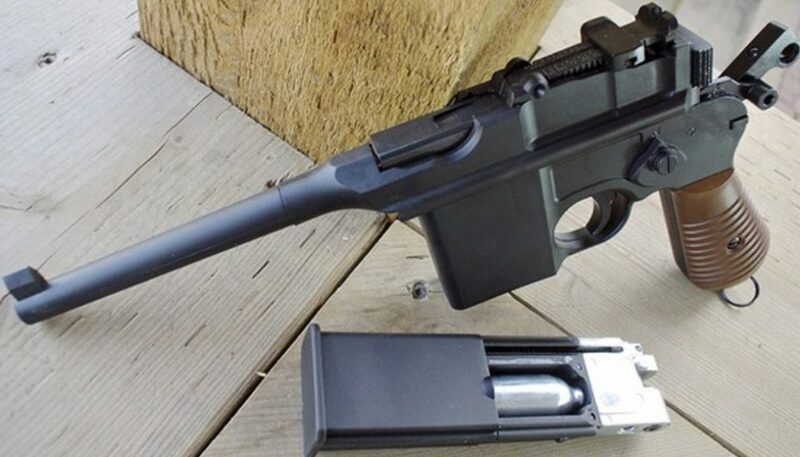 Thankfully, current versions of the Umarex Legends pistol are still blow-back, but made of metal and weigh in at 2¼lbs without the magazine. The mag’ weighs an extra 14oz without CO2 or ball, bringing the all-up unloaded weight to just over 3lbs. coating adds a little strength, which helps the balls to cycle through the blow-back action without deforming. I also tried uncoated lead balls but these did jam, so stick with the copper-coated lead. and a large Allen key is required to tighten the cylinder in order to pierce the neck in preparation for firing. Early variants used a fixed key and had a plastic cover. automatically. The returning bolt also feeds a fresh ball into the breech upon its return, and the pistol recoils with a realistic punch. There is a Fire Selector on the left side of the frame, which can be set at single-shot (N) or full auto (R). 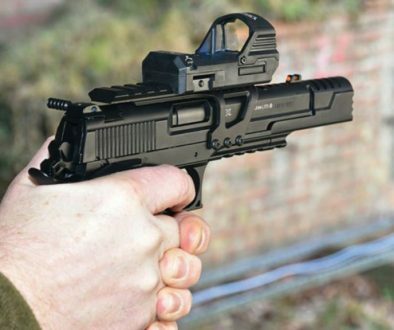 This is simply a moving realistic feature on the pistol because we are not allowed full-auto airguns in the UK, but US versions of this pistol can be fired on full auto. Reviews of original Schnellfeur pistols and the full-auto US Umarex versions apparently shoot high and waste ammo, but I’d love to try one all the same! American importer, A.F. Stoeger, sold the 20-shot Scnellfeur as the Model 712 during the 1930s and claimed that the Mauser was the strongest hitting and furthest-shooting pistol in the world. The rear sight was graduated up to 1000 yards! The Umarex model has a tangent rear sight, which is adjustable for elevation only, and shot high on the sight’s lowest setting. A higher foresight would have helped to bring groups down. The pistol performed well enough on the range though, and initially dropped all of the fairground finger targets on my indoor range as quickly as I could pull the trigger. Moving outdoors, soft-drink cans were mangled in no time at all and skittles fell with a satisfying clunk when I extended the range to 10 yards outdoors. Despite the front-heavy appearance, I found the Mauser comfortable on aim and the heavy construction made the pistol feel ‘right’ in my hands. The trigger broke crisply, although it was placed a little closer to the grip than I am used to, which is a feature of the original. The Mauser pistol can be seen in numerous films, including ‘Joe Kidd’ and ‘The Great Silence’, one of the best Spaghetti Westerns made, in my view. Whenever the Mauser appears in a film, it is shot very rapidly to accentuate the automatic feature when compared with revolvers, and I counted over 20 shots from a 10-round magazine being fired by Clint Eastwood in one Joe Kidd scene! Nevertheless, the pistol adds class to a film, just as the Umarex adds class to a collection of CO2 pistol clones. Review originally featured in Airgun World magazine. Versatile, compact, and now a fully licensed Air Pistol! 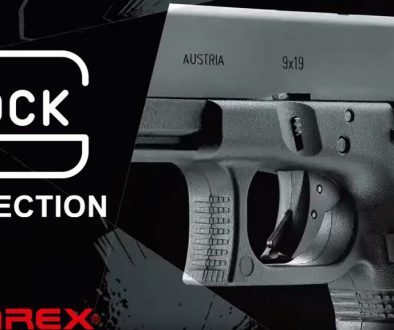 Introducing the GLOCK 19 by Umarex.